Theresa May has responded to Jeremy Corbyn’s letter setting out his five demands for a Brexit deal. 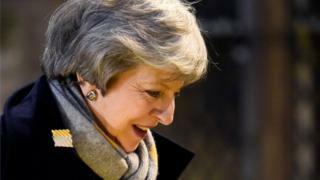 The prime minister queried his call for the UK to stay in a customs union with the EU – but welcomed more talks with Labour on a Brexit agreement. Mrs May wants the two parties to discuss how “alternative arrangements” to the Irish backstop – a commitment to avoid a hard border – could work. She did not reject any of his conditions outright in her reply. Meanwhile, Brexit Secretary Steve Barclay and EU negotiator Michel Barnier will hold talks in Strasbourg later, as the EU and UK Brexit negotiating teams discuss proposed changes to the deal. A “permanent and comprehensive UK-wide customs union” with the EU, with the same external tariff. It would give the UK a say on any future trade deals that the EU may strike. BBC political correspondent Iain Watson said it appears there are some potential stumbling blocks to a deal. The existing Political Declaration, setting out the goals for the future relationship between the UK and the EU, “explicitly provides for the benefits of a customs union – no tariffs, fees, charges or quantitative restrictions across all sectors and no checks on rules of origin”, Mrs May told Mr Corbyn. It also recognises the development of the UK’s independent trade policy, she added. Mrs May said securing frictionless trade for goods – which means trying to do business between the UK and the European Union with the minimum of tariffs, quotas, customs checks and other obstructions – was “one of our key negotiating objectives”. She added: “The fundamental negotiating challenge here is the EU’s position that completely frictionless trade is only possible if the UK stays in the single market. In response to Labour’s third demand, to stay in step with the EU if workers’ rights improve in Europe, the prime minister said existing rights will be protected. But there will be no automatic upgrade in line with the EU, she said. However, she said she would be prepared to commit to asking Parliament if it wanted to follow suit each time. She agreed with Mr Corbyn’s fourth point – that the government supports participating in EU programmes – but said this is already set out in the political declaration. And she said the government shared Labour’s ambition in relation to security after Brexit. She outlined several measures which had been agreed – including “arrangements akin to the European Arrest Warrant”. But she said the challenge came from the EU, which is restricting how much the UK participates in joint security after Brexit. “Labour’s support for this position going into the next phase will I hope send a powerful signal that the EU should reconsider its stance,” she said. The letter concludes with Mrs May saying she looked forward to the two parties meeting “as soon as possible”.